A desire to help scholars achieve their academic and career goals leads Emory law professor Tim Holbrook to a new role, where he will focus on supporting, uniting and diversifying faculty. 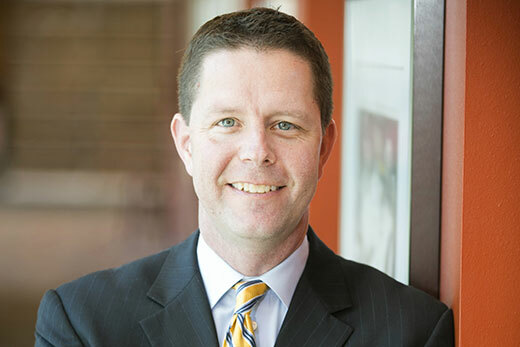 When Timothy Holbrook was named associate dean of faculty at Emory University School of Law six years ago, he saw the appointment as a natural next step that closely aligned with his interests. “I entered the academy not only to be a scholar but to help develop people,” explains Holbrook, Asa Griggs Candler Professor of Law and an internationally recognized patent law scholar. In the classroom, Holbrook found deep personal satisfaction in helping students learn and advance toward their career objectives — a role he also enjoyed while he worked with scholars and colleagues as associate dean of faculty for Emory Law. Now Holbrook will have the opportunity to pursue that goal within the larger university community. Dwight A. McBride, provost and executive vice president for academic affairs, announced June 22 that Holbrook has been appointed vice provost for faculty affairs, effective Aug. 1. McBride praised Holbrook’s distinguished record of academic achievement, his commitment to improving diversity among Emory School of Law faculty and his work to provide direction of, and vision for, the law school’s contributions to the academic mission of the broader Emory community. As vice provost for faculty affairs, Holbrook will oversee activities across campus that support faculty recruitment, retention and success at the university level, including working with the Center for Faculty Development and Excellence, the Emory University Emeritus College, the Tenure and Promotion Advisory Committee and university policies that impact faculty life. In his new role, Holbrook says he looks forward to helping make sure that faculty hiring committees follow best practices for inclusive searches consistently throughout departments and units across campus. Most recently, Holbrook put that philosophy to work while serving on a faculty appointments committee within the law school. “We just started working to make sure that among our lateral candidates, the pool was diverse, asking experts in the field for potential candidates, but also specifically and intentionally asking if there were women, people of color and LGBTQ candidates who were outstanding in their fields,” he says. “I want to work with the Office of Equity and Inclusion to make sure those kinds of best practices really take hold,” he adds. By encouraging leadership development, not only does a university help prepare faculty to transition into future leadership positions, “you have faculty on the ground willing to stretch and push and help an institution,” he says. For Holbrook, the appointment also offers an exciting opportunity to work with McBride in the quest to “develop and celebrate our faculty across the university and hopefully bring a greater sense of unity to faculty, a reminder that we are all part of the larger institution,” he says. Holbrook arrived at the Emory School of Law in 2009 to begin an appointment as professor of law, where he has taught courses in patent law, international intellectual property, patent litigation, trademark law, copyright trade secrecy and property. He is also a sought-after media commentator on LGBTQ legal issues. He graduated from North Carolina State University with a bachelor of science degree in chemical engineering before earning his juris doctorate from Yale School of Law. Holbrook would go on to serve as a law clerk for the Honorable Glenn L. Archer Jr. of the U.S. Court of Appeals for the Federal Circuit and to practice law with the firm of Wiley, Rein and Fielding (now Wiley Rein), in Washington, D.C.
Before coming to Emory, Holbrook was an associate professor of law at Chicago-Kent College of Law at the Illinois Institute of Technology. He has also served as a visiting law professor or scholar-in-residence at Central European University, Budapest, Hungary; the University of Denver’s Sturm College of Law; Stanford Law School; Lund University School of Law, Lund, Sweden; and Washington University School of Law. With the new appointment, Holbrook will devote 75 percent of his time in the provost’s office and 25 percent of his time to the law school, where he will teach one class a year and pursue his own research, which has focused on patent law and international patent law, 3D printing, biosciences and trademark law.